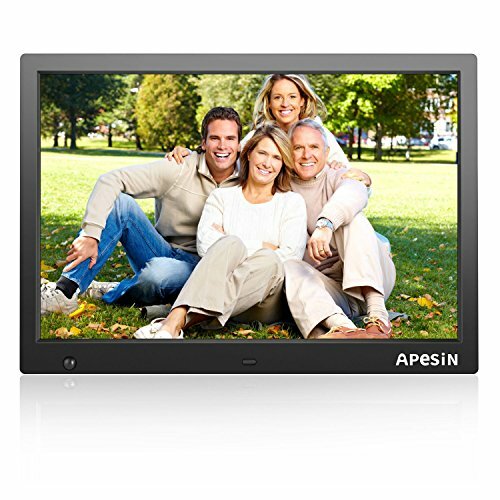 A great choice for a birthday, or a festival gift.You can share APESIN digital photo frame with your lover, family or friends,it can strengthen your relationship. Worth the money,Do not hesitate to buy it now! 1. It's convenient and safe to upload photos and videos from your phone to the digital picture frame. 2. Support up to 32 GB of memory card, save and display your valuable pictures and videos at any time. 3. Multifunction digital photo frame, support video, picture, audio and also with calendar, clock function. 4. Rotate Support / Slide Show / Auto-Off. It can display slideshow with background music, just enjoy the beauty time. The latest in LCD screen technology brings you 1440x900 high-resolution IPS (16:10) to display photos. Multifunction: It can work as an MP5 to play MP3, Pictures, Video Player and Slides, while also functioning as E-book/ Clock/Calendar/Alarm clock/Multi-language. Easy to operate: plug in USB and SD card, instantly display all your digital photos. Comes with an intuitive remote control. Hassle-free warranty: one-year unlimited warranty means we've got you covered! Contact us for an easy and fast replacement. If you have any questions about this product by APESIN, contact us by completing and submitting the form below. If you are looking for a specif part number, please include it with your message.